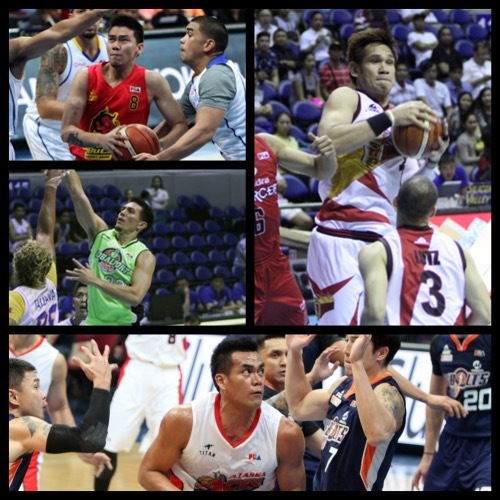 The race for the quarterfinals in the 2015-2016 PBA Philippine Cup heated up these past couple of days after wins by San Miguel Beer, GlobalPort, Barako Bull, and Alaska. The Aces and Beermen are tied for the top spot, while the Batang Pier remained in the top four and the Energy are knocking on the door for fifth place. The GlobalPort Batang Pier blew a huge lead but managed to withstand a rally by the NLEX Road Warriors en route to a 96-90 win in the SMART BRO PBA Philippine Cup Wednesday at SMART-Araneta Coliseum. Terrence Romeo and Stanley Pringle tag-teamed in this one, with Romeo pouring in 29 points and Pringle firing 27 to propel the Batang Pier (5-3) to the victory. Asi Taulava scored 29 points and 12 boards but his performance wasn’t enough to complete the comeback by the Road Warriors (4-4). The Batang Pier held the upper-hand early in the game, leading by eight, 18-10, that they expanded to 18, 53-35, after capitalizing on NLEX’s struggles and also a huge blunder by the Red Warriors at the end of the second quarter. With Keith Jensen launching a desperation heave from halfcourt, Sean Anthony clipped his arm, prompting referees to blow the whistle. Mac Cardona, who was also in the play, then pulled the LED board underneath the officials’ table in frustration to the call. A technical was called on Cardona and also on NLEX team manager Ronald Dulatre for crossing the court, while a personal foul was called on Anthony. That gave five free throws to GlobalPort, with Romeo, who finished with 21 at the half, sinking the two and Jensen making two also. 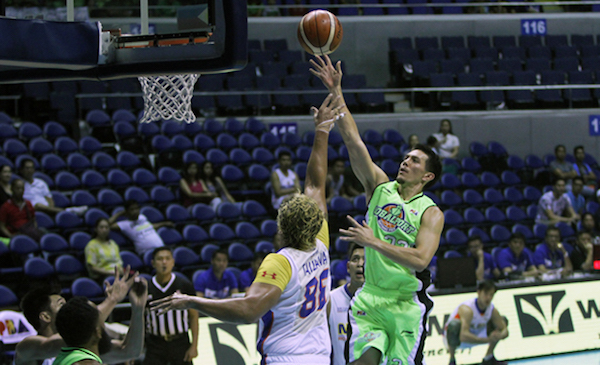 With Pringle this time leading the way, GlobalPort maintained its 18-point lead, 75-57, in the third period. NLEX couldn’t get the breaks in the end as GlobalPort held on. Stanley Pringle (GLO) - 27pts, 7rebs, 3asts, 1stl, 10/13 FGs. Asi Taulava (NLX) - 29pts, 12rebs, 4asts, 1stl, 1blk, 9/19 FGs. 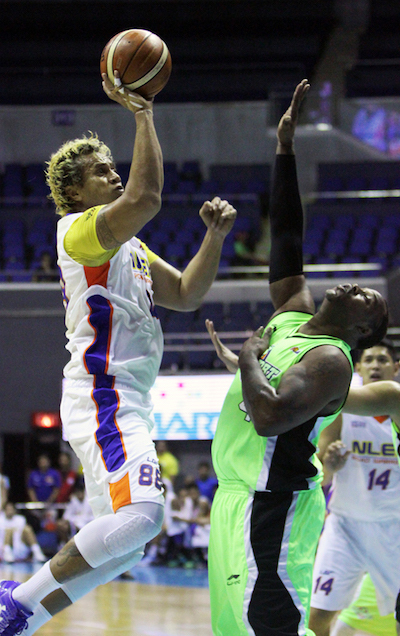 Asi Taulava continues to be a monster in the paint for NLEX. Keith Jensen has been playing really well for the Batang Pier this season. Reigning back-to-back PBA MVP June Mar Fajardo was in dominant form as he led his San Miguel Beermen to a huge win over the Mahindra Enforcers, 102-86, that helped them recapture the solo lead in the SMART BRO PBA Philippine Cup on Wednesday at the SMART-Araneta Coliseum. Fajardo posted 35 points on 13-for-17 (76%) shooting from the field and a perfect 9-for-9 from the free throw line alongside 11 rebounds and three blocks in 34 minutes of play. He led the San Miguel to a fifth straight win, pushing their record up to 7-1 to move ahead of Alaska and Rain or Shine, who are both 6-1, atop the standings. “The Kraken,” who made his first 10 field goal attempts, already had 19 of his total in a competitive first half before continuing his fine play in the third quarter, where the Beermen turned the game into a blowout. Brian Heruela finished with 14 points, while Ronald Tubid and Arwind Santos each added 11 for SMB. JR Reyes chipped in with 10 markers and seven boards. Mahindra, which was led by Aldrech Ramos’ 13 points, dropped to 2-6. June Mar Fajardo (SMB) - 35pts, 11rebs, 2asts, 1stl, 3blks, 13/17 FGs. Bradwyn Guinto (MAH) - 12pts, 12rebs, 1stl, 1blk, 6/11 FGs. Bradwyn Guinto has been a revelation for the Enforcers. 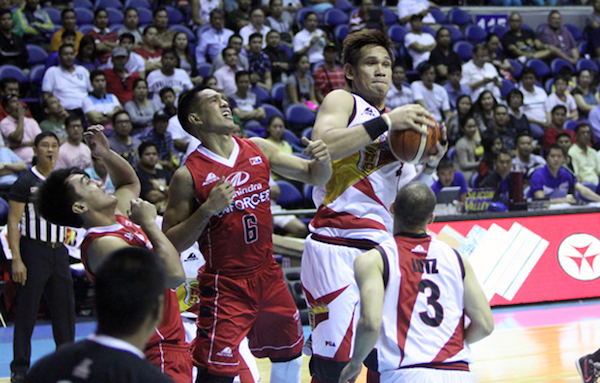 June Mar Fajardo was a dominant force for the Beermen in the middle. Barako Bull shackled Talk ‘N Text in the overtime period as the Energy picked up a tough 105-98 win to snap a losing slump in the SMART BRO PBA Philippine Cup on Thursday at the Mall of Asia Arena. Willy Wilson had a terrific performance, notching 28 points and 20 rebounds, while RR Garcia added 22 markers to lead Barako Bull. JC Intal also had a big game, finishing with 12 points, 14 rebounds, and four assists for the Energy. Barako Bull, which had lost its previous two games, improved to 4-4 for the conference while knocking Talk ‘N Text down to 4-3. The teams needed an extra period after dueling to a 97-all deadlock after four quarters of play. 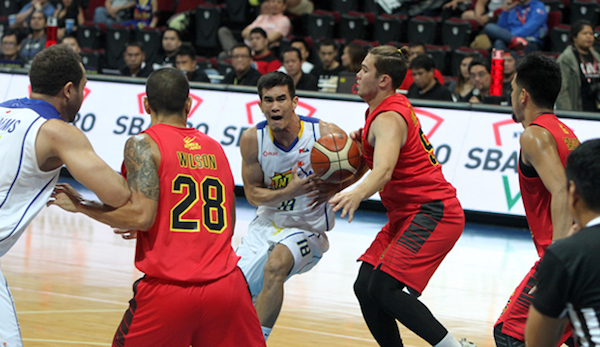 But Barako Bull dominated the overtime, scoring eight points while allowing only a solitary point on the other end. Mo Tautuaa led Talk ‘N Text with 20 points, while fellow rookie Troy Rosario had 19 points and nine rebounds. Castro also had 19 markers, while dishing out six assists. Willy Wilson (BAR) - 28pts, 20rebs, 3asts, 1stl, 1blk, 10/18 FGs. Jayson Castro (TNT) - 19pts, 5rebs, 6asts, 1blk, 8/19 FGs. 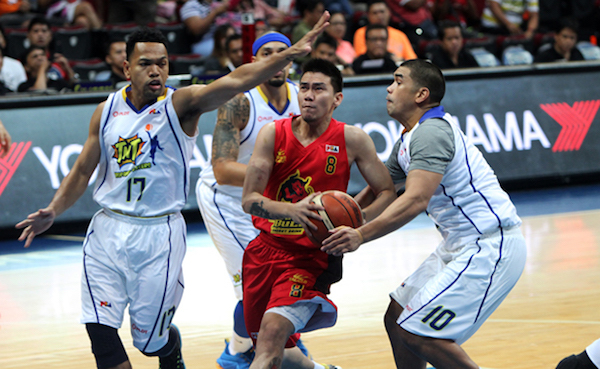 RR Garcia waxed hot for Barako Bull as they beat TNT. Rookie Troy Rosario continues to impress for the Texters. 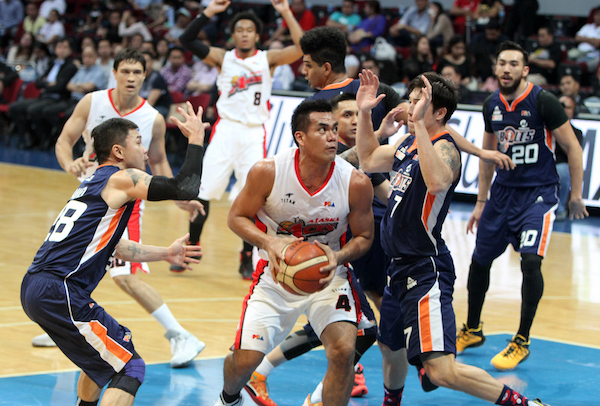 The Alaska Aces eked out a tight victory over Meralco, 88-86, to climb back into a share of the No. 1 spot in the SMART BRO PBA Philippine Cup standings on Thursday at the Mall of Asia Arena. Vic Manuel and Cyrus Baguio led Alaska with 13 points apiece, towing four other Aces in double figures in a balanced offensive performance for the team. 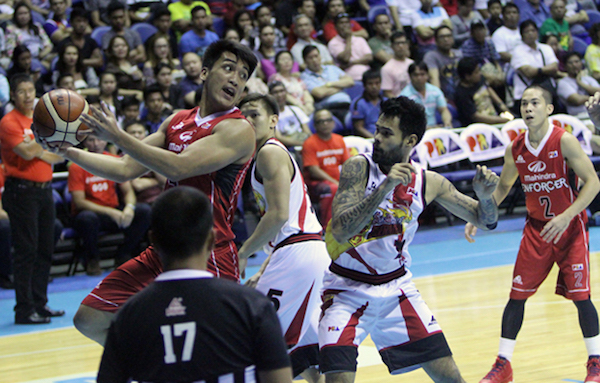 JVee Casio scored 12 points, Dondon Hontiveros and RJ Jazul each added 11 and Sonny Thoss posted 10 for Alaska, which improved to 7-1, tying the San Miguel Beermen for the top spot. 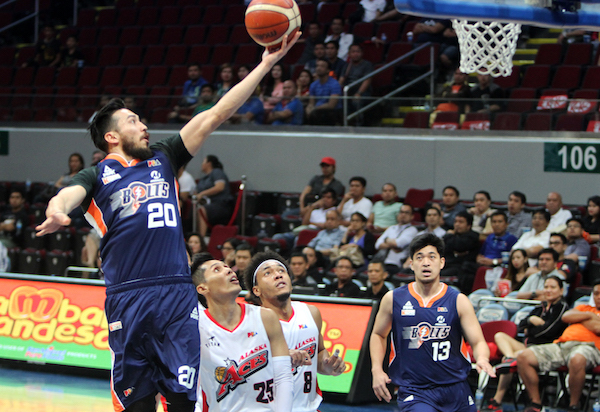 The Aces went on a 16-0 run in the fourth quarter to turn a six-point deficit into a double-digit lead but still needed some big plays down the stretch to escape with the win. Meralco got a huge game from Cliff Hodge, who had 25 points and 13 rebounds. Vic Manuel (ALA) - 13pts, 9rebs, 1ast, 2stls, 1blk. Cliff Hodge (MER) - 25pts, 13rebs, 3stls, 2blks, 11/16 FGs. Jared Dillinger rises high for the lay-up. Vic Manuel tries to carve some space down low for the Aces.